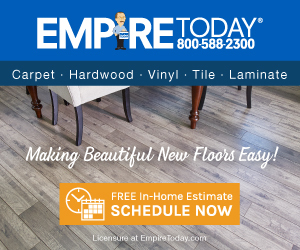 Empire Today - Empire Flooring are deceptive, rude and LIARS!! weâ€™re disappointed that you were inconvenienced by the issues that occurred during your installation. We understand that weâ€™ve been in contact with you about possible resolutions and that you chose to cancel the order. Please donâ€™t hesitate to contact us with any additional questions or concerns at 888-588-2315 x4195 or customersupport@empiretoday.com. Agreed to pricing on hardwood flooring. Installer came in and said floor was uneven and it would cost an extra $2000. Sales rep said she went over it with us. NOT TRUE. The installer's contact at Empire (Roger?) told my wife I was a liar and then the next day that she was a liar. The only people lying work for Empire Flooring and their sub-contracting sales people. After they ripped up portions of our carpet and parquette(? ), they said they were leaving and Mike, the installer, who by-the-way had nothing to do with this, tried to piece it back as best he could. Do Not Use this Company. Ever!!!!!!! Review #300762 is a subjective opinion of User300762.